sponges and fibrin glue application, microwave thermotherapy, ultrasonic surgical aspirator, laser (holmium:neodymium:YAG laser), or prior radiofrequency coagulation (62,80-86). Physical compression of the kidney using parenchymal tourniquets and cable tie devices has been described in an attempt to achieve regional vascular control during polar partial nephrectomies (48,88,89). Gettman et al. (85) performed laparoscopic partial nephrectomy with the assistance of radiofrequency coagulation technique in 10 patients with a solid renal lesion. A spherical area of coagulation including both the lesion and a 1-cm margin (at least) of normal parenchyma was created by deploying a percutaneously positioned radiofre-quency probe. 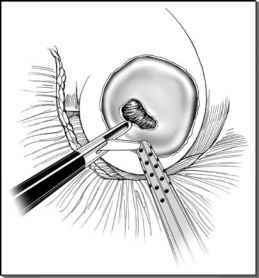 After probe withdrawal, the lesion and 0.5-1 cm of normal parenchyma were excised using laparoscopic scissors or ultrasound shears. Median blood loss was 125 mL, and complete hemostasis was reported in all cases. However, insufficient deployment of the RF probe in one patient resulted in large blood loss (700 mL) due to incomplete coagulation of a margin. Thus, adjunctive agents (fibrin glue, argon beam coagulation, or oxidized cellulose) were necessary. Negative margins were confirmed by frozen section analysis of 5 mm cup biopsies from the surgical bed. Biologic hemostatic agents have been employed to facilitate hemostasis during laparoscopic partial nephrectomy (90,91). Fibrin sealant (glutaraldehyde cross-linked fibers derived from bovine collagen) application facilitates the last step of the clotting cascade (fibrinogen to fibrin conversion). Further, cross-linking of soluble fibrin monomers creates an insoluble fibrin clot acting as a vessel sealant. The gelatin granules (500-600 ^m size) swell upon contact with blood and create a composite hemostatic plug with physical bulk that mechanically controls hemorrhage independently from the natural coagulation cascade (92). resection, followed by a 1-2 minutes compression of the resected surface with a sponge stick. After releasing the previously positioned hilar clamp, hemostasis was obtained within 5-10 minutes. No bleeding occurred after clamp removal, and no blood transfusions were required. The collecting system was not entered in any patient. Median operative time was 3.2 hours (range, 1.5-3.9), median warm ischemia time was 13 minutes (range, 10-14), and median blood loss was 200 mL (range, 50-350). Although the use of this bioadhesive was reserved for selected, small, exophytic, superficial tumors not requiring pelvicalyceal entry, the results of this study, particularly as regards shortened warm ischemia time, were encouraging. The capability of the biologic hemostatic sealant Floseal®b in facilitating hemosta-sis during laparoscopic partial nephrectomy was recently evaluated at the authors' institute (94). After completing the initial 224 laparoscopic partial nephrectomies, from patient number 225 onwards the author's laparoscopic partial nephrectomy technique (51) was modified to incorporate topical application of the gelatin matrix thrombin sealant (Floseal) to cover the partial nephrectomy bed prior to sutured renorrhaphy over a bolster. The prepackaged hemostatic sealant comprised 1.5 cm3 of dry bovine-derived gelatin matrix provided in one syringe, and 5000 U.S. units of bovine-derived thrombin provided in a vial, which was drawn up in a second syringe. The two were admixed, thereby creating 4 cm3 of gelatin matrix thrombin slurry in a single syringe. This syringe was connected by luer lock to a 14Fr, 30 cm long reusable metal delivery cannula introduced into the abdomen through a 5 or 10/12 mm laparoscopic port. The slurry was layered directly onto the renal surface, covering the entire partial nephrectomy bed. Surgical bolster was then positioned and renorrhaphy sutures secured prior to hilar unclamping. Usually, two vials of Floseal were employed per patient. The gelatin matrix and thrombin slurry were used within 2-3 minutes of being admixed (if allowed to stand for a longer duration of time, the slurry becomes more viscid, making it difficult to inject through the metal cannula). Postoperative strict bed rest for 24-48 hours, followed by restricted activity for two weeks, was prescribed. The impact of Floseal on reducing hemorrhagic complications was evaluated by comparing two sequential groups of patients: group I = no Floseal (n = 68), and group II = with Floseal (n = 63). Group I (no Floseal) and group II (with Floseal) were comparable as regards tumor size, number of central tumors, and performance of pelvicalyceal suture repair (84% vs. 92%; p = 0.16). Intraoperative variables were also comparable as regards mean warm ischemia time (36.1 vs. 37.2 minutes; p = 0.55), blood loss (150 vs. 106 cm3; p = 0.36), operative time, and hospital stay. Compared to the no Floseal group, the Floseal group had significantly decreased overall complications (37% vs. 16%; p = 0.008), and tended towards a lower rate of hemorrhagic complications (12% vs. 3%), although this did not achieve statistical significance (p = 0.08). In the authors' experience, adjunctive use of gelatin matrix thrombin sealant substantially enhanced parenchymal hemostasis and decreased procedural and hemorrhagic complications to levels comparable with contemporary open partial nephrectomy series. As such, this gelatin matrix-thrombin tissue sealant has become a routine part of laparoscopic partial nephrectomy at our institution. However, we emphasize that ready facility with laparoscopic suturing is important to manage persistent hemorrhage occurring despite the use of gelatin matrix thrombin sealant. Urena et al. (95) reported their initial experience with a monopolar radio frequency devicec to perform laparoscopic partial nephrectomy without clamping the renal vascu-lature. A monopolar device that uses radio frequency energy with low-volume saline irrigation (4-6 cm3/min) was employed for simultaneous blunt dissection, hemostasis, and coagulation (coagulation power of 80 W on a regular electrosurgical generator) of the renal parenchyma. Technical characteristics of this technology included precoagu-lation of soft tissue with simultaneous sealing of small-sized blood vessels, parenchy-mal thermal coagulation depth directly proportional to the type and duration of contact between the device and the parenchyma, and saline-facilitated energy transfer at the tissue-device interface preventing tissue desiccation and smoke production. The study was conducted on 10 patients with a mean tumor size of 3.9 cm (range, 2.1-8). Mean operative time was 3.9 hours (range, 2.4-4.7), and mean blood loss was 352 mL (range, 20-1000). Technical difficulties due to posterior tumor location led to open conversion in a morbidly obese patient. Blood transfusion was required in one case, and mean hospital stay was 1.7 days (range, 1-5). Postoperative complications included urinary leak managed by ureteral stenting in one patient. Pathology confirmed renal cancer case in bBaxter Healthcare, Deerfield, IL. cTissueLink, TissueLink Medical, Inc., Dover, U.K.
80% of patients, with negative margins in all cases; no interference with pathological evaluation of surgical margins due to tissue charring were reported.